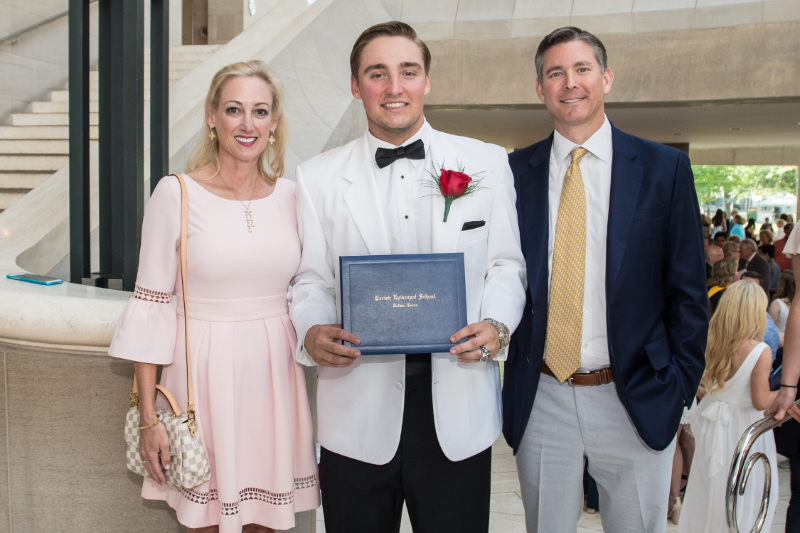 Lisa and Bill Griffin are among the Class of 2017 parents who gave to both the Senior Class Gift, as well the Campaign for new Parish facilities. The family, which has been a member of the Parish community since their son Michael’s 7th grade year, made generous Campaign gifts totaling $120,000. Your son Michael graduated this spring. What was it like watching your child walk across that stage? Lisa: It’s one of the proudest, saddest moments of my life as a parent! As a mom, of course I had a lot of tears. I don’t think there was a dry eye in the place! But it’s also such a tremendous feeling seeing that your child is fully ready and equipped to go to college and the real world. Bill: You also get a sense of just how close the kids are and how supportive they are of each other. It’s a close knit and really inclusive group, and you saw lots of reminiscing and lots of kids being visibly excited for each other. You’d think, walking across that stage, they’d be nervous. Maybe they were, but what I saw was pure joy. What inspired you to invest in the Campaign as you’re closing this chapter at Parish? Bill: We really felt it was a matter of responsibility – to give back to the school that had been so impactful in Michael’s life and to acknowledge the quality of a Parish education. One of the things we have always admired about the Parish community is that everyone does their part in one way or another, with money or time or both. This was one way we could help. Lisa: Yes, and we know first-hand how important outlets outside academics are to helping a kid grow and stretch. Football was a really important part of Michael’s Parish experience, and so was being in different theatrical productions. Parish has accomplished so much while making do in terms of facilities. Imagine what the students will do when we have the space and the facilities to take it to the next level. Lisa and Bill’s son Michael will be attending University of Kansas in the fall. Fortunately for Parish, that doesn’t mean the Griffins will be leaving our community. The couple plans to stay involved in fundraising for the School, and Bill joins the Board of Trustees for the 2017-18 school year.